Piano lessons are offered during school hours and arranged privately to all interested students in Kindergarten to Year 6. Lesson days are arranged in consultation with each student's class teacher to minimise disruption to class timetable. Lesson times are rotated throughout each day so that students do not miss the same part of the day each week. 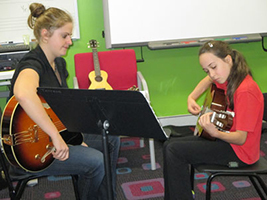 Guitar lessons are available at the school during school hours.